In addition to my normal reviews, including the 'Put the Boot In' feature, to keep things interesting for both my readers and myself, I will also include a 'Now Playing' article that will concentrate on the song of the moment for me personally, or possibly the song that pertains to that day in history, or a myriad of other reasons I cant possibly think of right now. Regardless, I'm gonna do it, I hope you like it, as always comments, discussions, and requests are always welcome. 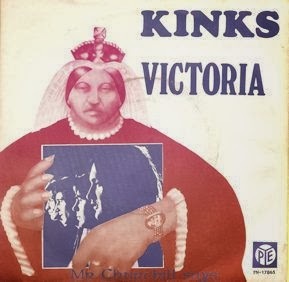 So, the tune (actually 7' single) that gets the special treatment for today is........ 'Victoria' by the Kinks, as it was this week 44 years ago that the single 'Victoria/ 'Mr Churchill Says' was released in the UK. 'Victoria', the opening track on the Kinks 1969 LP Arthur (Or the Decline and Fall of the British Empire) and is a kinetic history lesson full of patriotic expression. Most of the time it seems the song is sung with tongue firmly in cheek by songwriter Ray Davies. Staying true to his thematic songwriting choices, 'Victoria' echoes the Nationalism found running rampant in Ray Davies songwriting in this era, and right through to this day. But as always with Ray, you never can really tell. 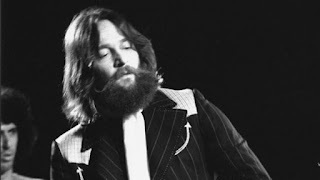 A striding acoustic guitar hi hat opening is the foundation for Dave Davies smooth and round reciting of the melody line on his guitar.Tastefully double tracked the guitar sound is vivid with color. The song cooks Chuck Berry style thought the verses quickly, before dropping off of the cliff into the dramatic 'land and hope' bridge, that swells with a prideful mischief and irresistible vocal melody. Dave Davie's understated guitar work throughout the song is masterful, from the hide and seek work in the verses, through the George Harrison-esque picking in the chorus, and specifically the minimalist and ice cool guitar solo. Similarly to 'Pinball Wizard' of the 'rock opera' Tommy, 'Victoria' is the big song to be pulled from the Kinks thematic opus. The song the center in which the rest of the collection revolves. The live versions available of this tune are especially good, and the various BBC versions are a treat. I have included a wonderful version below for your review. The 'B" side to the British version of the 'Victoria' single is also culled from the LP Arthur. The track 'Mr. Churchill Says' starts as a home style, yet funky, loyal and resolute reflection on post war England. Sturdy in its composition, serious in content, but injected with Ray Davies always satirical delivery. Swinging old time anthem for part of the tune, the song then flashes forward to the time of its development, an electrified 'Wake Up Little Suzie' riff appears in conjunction with a rotating air raid siren and takes the track on a new musical direction, complete with rhythmic and tribal bell cymbal dings, and an extended tropical Dave Davies guitar flurry. The song hits a moment of transcendence just as it escapes the hypnotic beat, then breaks into a doubled descending guitar bridge. The crashing gorilla drums thump out a patriotic high school football chant that pulls a whip saw and races toward the songs conclusion. The groovy Ray Davies vocals move throughout, ranging from the bottom of the rock scale and up through falsetto, hitting everything in between. ending in the aforementioned chant. One of my personal favorites on the record, and an ace choice for a UK 'B' side. The 'Victoria'/'Mr. 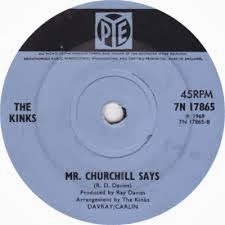 Churchill Says' single of December 1969 would usher in a new era for the Kinks, where within the next year their popularity would reach unbelievable levels. The single also places two foundational pillars of the narrative of Arthur out of context, but displaying their perfect construction. Below are the components of this single for your enjoyment.